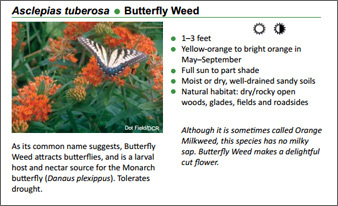 There is an excellent resource available for native plant enthusiasts in Northern Virginia. It’s the “Plant NoVA Natives” initiative sponsored by state and local environmental groups and local nurseries to promote the use of native plants. The purpose of the organization is to make “using native plants in the Northern Virginia landscape easy and fun“. They’ve published a booklet that describes and lists plants native to Northern Virginia that “are attractive, relatively easy for the home gardener to acquire, easy to maintain, and offer various benefits to wildlife and the environment“. The booklet is available in print and online. The booklet has plant descriptions as well as lists of plants and the conditions that they like. You can learn more about the organization (and view the booklet online) at their web site at http://www.plantnovanatives.org/. Look for them at plant sales and partnering with native plant groups in the region. You could even go to your local nursery and suggest that they join the “Plant NoVA Natives” program to help make native plants readily available to gardeners in our area.